This piece focuses on AirAsia’s in-flight product, as observed and experienced firsthand by The Flying Engineer on the airline’s maiden commercial flight on June 12th, 2014. 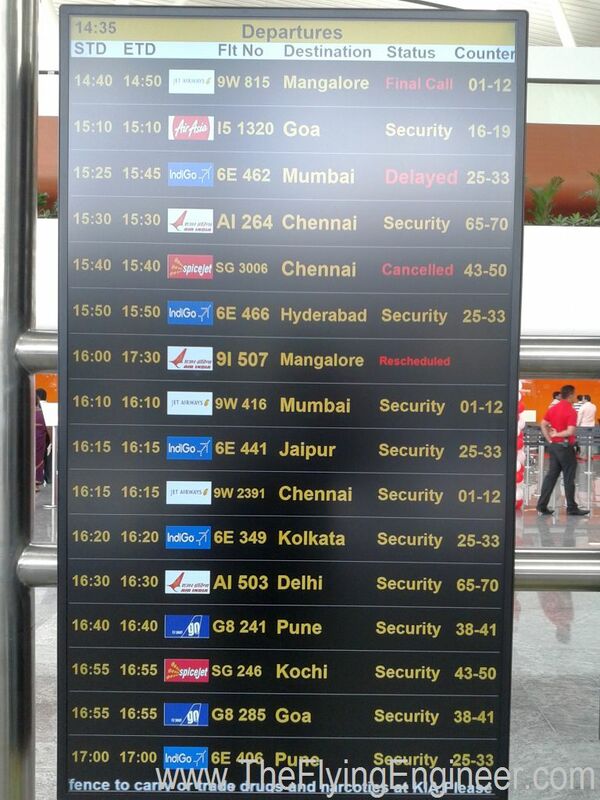 Two airlines in India seem to be most disturbed by the entrance of AirAsia India-SpiceJet and Indigo. IndiGo has reportedly resorted to tactics to try and prevent AirAsia India from taking off. SpiceJet is believed to be on the clean side, trying to become an AirAsia to compete with AirAsia. And then from the ruling political party, BJP, Sumbramanian Swamy, letters have been sent to the DGCA and the Prime Minster of India, N. Modi, requesting the first commercial flight of AirAsia to be prevented. The Federation of Indian Airlines (FIA) sent a letter to the DGCA questioning the grant of the AOP, on grounds of flight schedule approval with a single aircraft, issues of substantial ownership, decision to grant the AOP pending in the courts, and more. Yet, at the noon of June 12th, 2014, Mittu Chandilya, CEO of AirAsia India, was dressed smart, and towered above the flock of media persons with his height and confidence. The scheduled time of departure for the first commercial flight-Bangalore to Goa- as i5 1320, was 15:10 IST, and with every passing minute, AirAsia India inched closer to reality. Staff of the airline were abuzz with excitement, proud of the “wings of change” that they believe AirAsia India is bringing. The first visible signs of change? The check in counters, where the boarding pass is nothing more than one and a half (not even two) slips of thermal paper that resemble a supermarket bill. It created quite a flurry at the security check, where the CISF (Central Industrial Security Force) staff were amused and initially unconvinced with a boarding pass so alien. AirAsia’s i51320 listed on the departures. The Flying Engineer had a lively conversation with the security staff, who asked why so many employees were travelling on board. They were told that it was the first flight, and that AirAisa had offered tickets as low as around INR 300, all inclusive. The usual steeled look on their faces gave way to smiles, with animated talks between the staff on planning a trip to Goa with AirAsia, with such low-ultra low-albeit one time promotional fares. 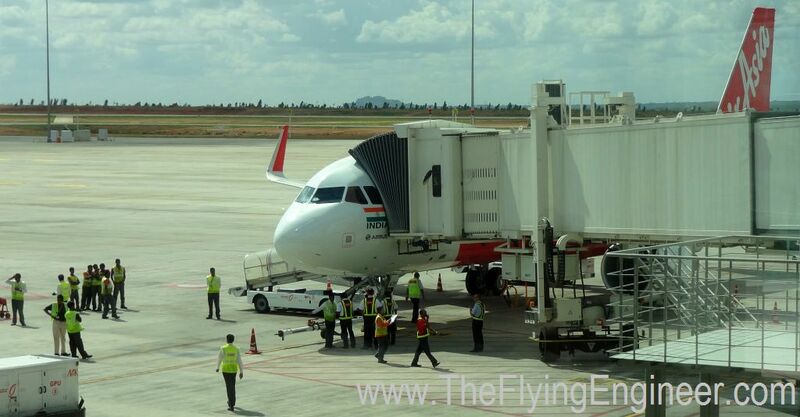 AirAsia India’s only aircraft, an Airbus A320-the 6015th to be produced, globally-registered VT-ATF was docked to the aerobridge at Gate 1 at Bangalore’s Kempegowda International Airport (KIA). There was no lack of show: the gate and aerobridge was decorated with flowers. Among the almost 180 passengers-a full A320 load- who flew that day (the flight was to run full, but a few didn’t turn up for the flight), 40 were staff and invitees (guests), and the rest 140 passengers. Present in that list of staff and guests were the CEO-Mittu, and the CFO-Vijay Gopalan, their families. 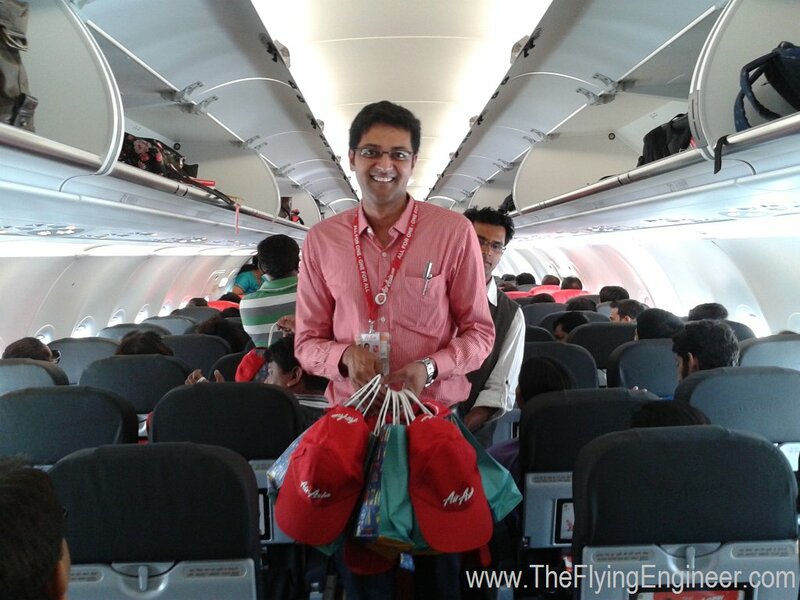 AirAsia India CFO Vijay Gopalan handing out caps and mugs to passengers of the first flight. The welcome at the airplane’s passenger door was standard, but that’s where everything standard stopped. The airline very successfully created an atmosphere of celebration, with engineers, cabin crew, other department heads, staff, the CFO, and the CEO handing out first flight goodies-a mug and a cap branded with the AirAsia logo-to passengers. Something that was lost with low cost air travel in India-boarding music-was played, and very naturally, the airplane was clean, and still smelt just like what it would have at the Airbus delivery centre at Toulouse, France. Amidst all the celebration, and something that happens on every first flight that involves a bit of a show, the flight got a little delayed. The aircraft pushed back at 15:33hrs-23 minutes behind scheduled departure. AirAsia India’s first revenue flight got airborne at 15:45hrs IST, amidst a loud applause in the cabin, and finally breaking free of the ground despite the stiff opposition and hurdles that the airline faced in its overdue gestation period. The one time celebration and one time all time low promotional airfares are, well, one time. The real focus for most passengers are just four simple things, in order of priority-timing of the flight, the fare, the on time performance record, and the in-flight experience. For passengers, such as tourists and casual travellers who can exercise a flexibility in the time and perhaps the date of travel, the first two parameters get switched in their priority. Till AirAsia India grows its fleet size, it cannot offer multiple options on the same route, like that of some of its established competitors. But for similar timings, AirAsia India, which is confident of sustaining low fares for a good portion of its route capacity, will have all its fares matched by IndiGo, and some, but not all, of its fares by SpiceJet. This automatically shifts a subset of the market in favour of AirAsia India and IndiGo. If the OTP history and fares are matched for the two competing airlines, for flight with similar timings, then that subset of the market should split almost evenly between the two airlines. Or will it? The fourth factor kicks into effect, which is the in-flight experience. This is where AirAsia India is going to win. The one advantage that AirAsia comes with is its age: it is young enough to effect changes quickly and efficiently, and carries with it no negativity based on past consumer experiences. SpiceJet is on a path of transformation: offering hot meals, clean aircraft, warm service. While it is on path, the airline is yet to reach its goal, and mass passenger perception about the airline is yet to change in its favour. Pleasing carts, crew, and efficient in-flight service. CEO Mittu addresses the passengers. AirAsia offers everything that SpiceJet now strives for: warm crew, good in-flight service, clean airplanes, comfortable seats, boarding music, and hot meals. The hot meal menu is sufficiently exhaustive, and is served warm atleast, if not hot, should your row be further from the galleys. The appeal starts to kick in when you see the carts: neat, very well arranged, and appealing. When the hot meal of your choice-assured when you pre-book, and a gamble when you don’t-is served, the packaging gives you reasons to smile. For one, it isn’t the standard mono-chrome silver-grey foil packaging. Its lively red, just like everything else at AirAsia. The packaging is sealed-giving the passenger the assurance that the contents are not tampered with. The food is well cooked, and is great considering the price for which it is available. The meals for AirAsia are prepared by Travel Food Services (TFS). While SpiceJet partners with TAJ-SATS and CCD (Cafe Coffee Day) for the hot meals / sandwiches, IndiGo has no ovens on board to offer hot meals. SpiceJet is diligently working towards a consistent quality as far as the meals are concerned; AirAsia seems to have already got this right, giving it an edge over its competition. The cabin crew on board the flight were warm, patient, and very helpful. “Standard” (black headrest) 29inch seat pitch leather seats. The in-flight experience is beyond food and service. It also includes the cabin ambience. 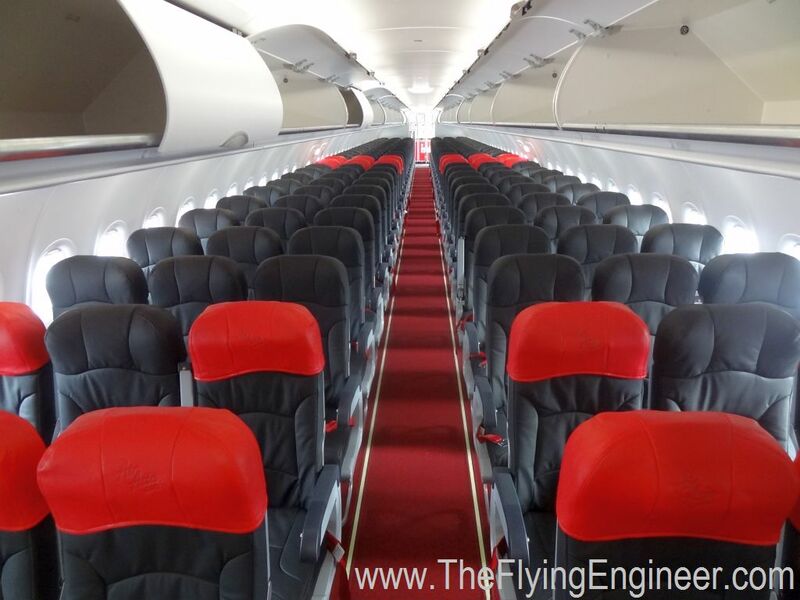 AirAsia’s aircraft is almost mint new, and this is responsible for a clean and new aircraft cabin. None of the colours in the cabin are depressing: the seats are dark grey with a matt finish, and some of the seats, which the airline treats as premium, have a bright red headrest. 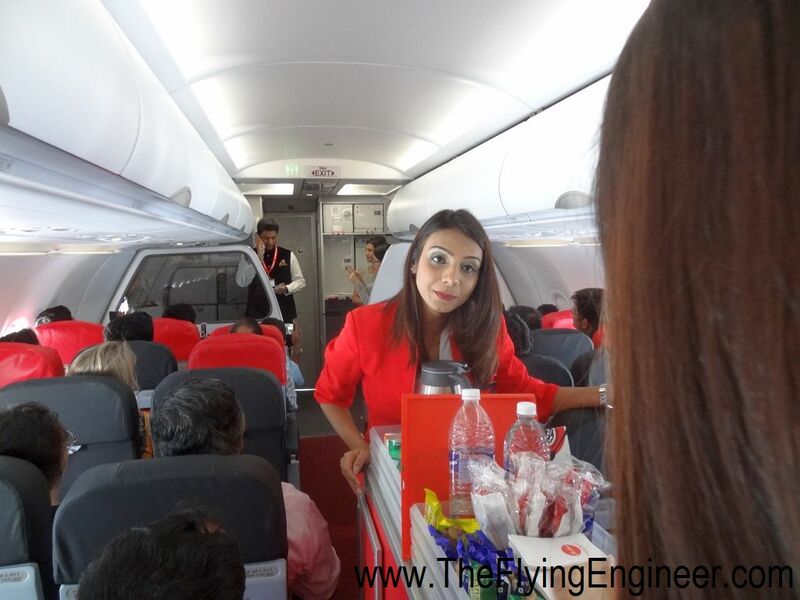 Female cabin crew are dressed in bright, lively red, and male cabin crew in jet black. The seat belts are bright red, and the contrast is not shocking, but very appealing. The white cabin, dark grey, matt-finish leather seats, and the crew uniform infuse a life into the cabin, which is welcome when compared to the relatively depressing colours of the competition. The seats on board are from B/E Aerospace, and are almost five inches thick at the headrest region. 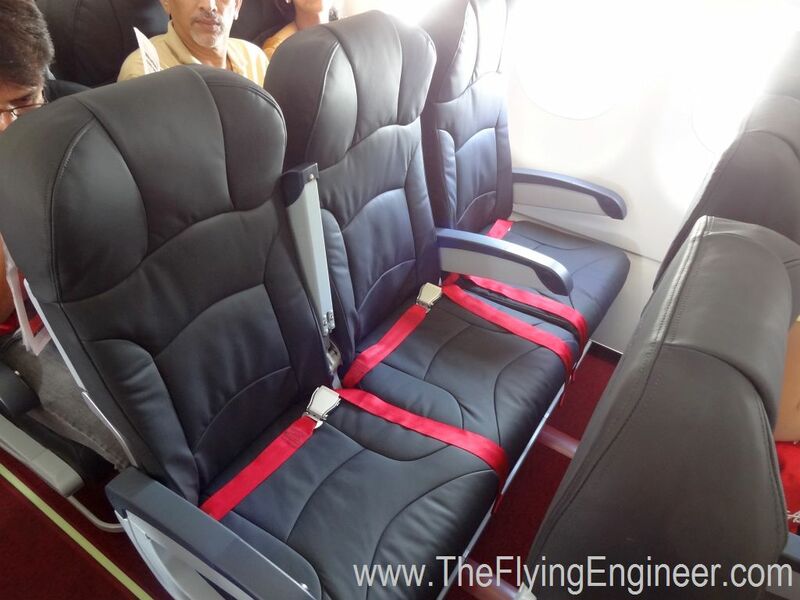 The cushioning is great, and the inner seat width (inner armrest to inner armrest) is 17 inches wide, which matches the seat width on SpiceJet’s and IndiGo’s. This allows the aisle to be 25 inches wide, which helps with reducing the turn-around time. Seat pitch is 29 inches for all seats except those on the first row and emergency exits (the all red-capped hot seat rows), which are 33 inches. When seated on a 29 inch pitch seat, a 171cm tall, average built person has around 2 inches of space between the knee and the seat pocket which is filled with an in-flight magazine, in-flight menu, safety information card, and a barf bag. With seemingly the best in-flight product in India, today, AirAsia becomes a preferred airline when fares, timings, and on time performance match or better those of the competition. IndiGo had set a trend of low cost not feeling really cheap, but AirAsia India has taken the in-flight of low cost to the next level: great ambience, great service, and a great in-flight meal and snack menu. Nothing about AirAsia India, atleast inside the airplane, feels cheap. Everything inside is bright, classy, and vibrant: low cost, but high appeal, catering to the corporate and casual traveller. AirAsia India gets real, and so does the threat to the competition’s market footing. The Flying Engineer also interviewed Mittu Chandilya, CEO, AirAsia India. That, and more of the airline beyond the in-flight will be up as a separate piece. First flight crew. Captain Manish Uppal, First Officer Diganta Mohanty, Cabin Crew in Charge Monica, and Cabin Crew Ayesha, Sindhu, and Sanket.